Best Thermal Scope Picture of a hunter using the thermal rifle scope while hunting. Long range scopes, rifles, thermal cameras, and binoculars industries are evolving every day with unique products, new technologies, and advanced features. As most of the people indulging in nighttime activities like trekking, hunting, shooting and hiking, the demand for night vision and thermal vision technologies has been increasing. People are focusing on upgrading their gears to be successful in the business. But you can’t simply spend on these devices as they are quite expensive. There are bad choices of devices that can make you lose your money for nothing. So before spending hundreds of dollars on night vision devices, you have to do deep research about the product, the latest technology, available brands, necessary features, additional functions, and the price. When it comes to the best thermal scope, the task becomes so hard because all the thermal device manufacturers have concentrated on producing something new and they’re working on to make their brand stand top in the market. To help you with this, we have taken responsibility of research on the best thermal scope to find the best one for your requirements; we have selected and analyzed 15 thermal scope products and 10 different thermal scope manufacturers. After the 30 hours of research, we have made the list of 10 Best Thermal Scope which we reviewed below. How to Choose the Right Thermal Scope? Are you in a hurry? Then look out the below image to get the glance about the working mechanism of Thermal scope. 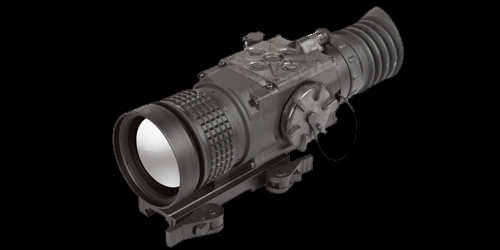 Like night vision optics, the thermal scopes also use the same infrared light to work. To understand the clear difference between night vision and thermal scope, you need to know about the range falling of IR light; Near IR, MID IR, Thermal IR. 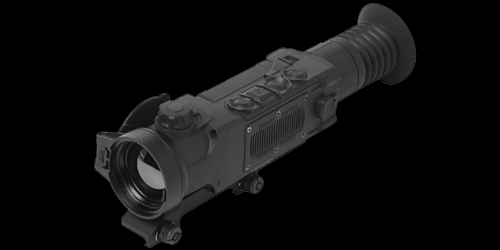 Near IR is similar to visible light and that used in a digital night vision scope. Though this light is very close to visible light, it is not visible to us. So the reflection and emission are normal. 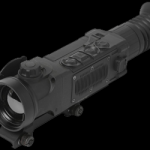 MID IR is the next range that is also used in night vision scopes. The longer wavelength and travel are its differences from Near IR. Thermal IR completely different from visible light and this is emitted by all the things around the world in the form of heat radiation. With this only thermal scope work. The lens inside the thermal scope is actually a phased array of IR detectors. As they are phased, when thermal IR hit the lens, the variable signal is generated depending on the intensity. And then the internal computer is allowed to produce the heat values pattern in the view of scope which is then called as Thermogram. This thermogram then transformed as the series of electrical impulses which are processed and converted as the raster display by the internal computer in the thermal scope. The raster display is in the form of a grid where each cell has a value. The concept of this process is to get the invisible image from thermal IR and translate it into the image in visible light. This is because you get the emitted radiation not the light from your target. After it is processed on the onboard computer, the colors will be added. This is what happens inside the thermal scope when you use it. So, below 10 are the best thermal scopes that we have found on today’s market. We have chosen the products from the prominent brands which differ in offering great quality, features, and price. So you can choose the scope which suits your field of use. We have also provided a detailed buyer guide if you can’t end up with the correct choice. You will get complete information about the available technology and features and other factors that every buyer should consider. Let’s begin our list. When you are searching for the best thermal scope that has an affordable price and various advanced features, then ATN Thor 384 would be the best choice for your nighttime pioneers. As it has a special feature of detecting heat energy instead of light energy impress the people to buy it. It also offers the qualified image and the smooth zoom to magnify your target. This ATN Thor has equipped with Ballistic calculator, so you don’t want to carry bundles of charts and maps with you. You need to just enter the environment details, all the other calculations were made automatically. So there are high chances to hit your prey in the first try itself. You can also improve your target with built-in smart rangefinder which provides the best target shooting as it has the ability to calculate the distance to offer you the best shot. You can record the activities handled using this best inexpensive thermal scope as HD videos. The high-resolution images provided by this thermal scope can be stored on an SD card that is injected in the rifle scope. so you don’t need any external cables to record as this ATN Thor scope has both recording and storage device in it. You can view those videos and images in your phone or tablet. You also have Wi-fi streaming and live video streaming in this thermal imaging scope. With these user-friendly features, Thor riflescope allows the user to share and review the performance of shooting. This Thor thermal scope has the power range 1.25x to 5x and the sensor resolution 384×288 pixels. The Focal length is 19mm. You will get a magnetometer, accelerometer, and gyroscope (all 3D). We have to appreciate the 20000mAh battery for the uninterrupted functioning of this thermal scope. So with this easy chargeable battery capacity, the scope can perform for 22 hours continuously. You can access the other functions of thermal scope such as sharpness, contrast, and magnification levels using the remote access control. 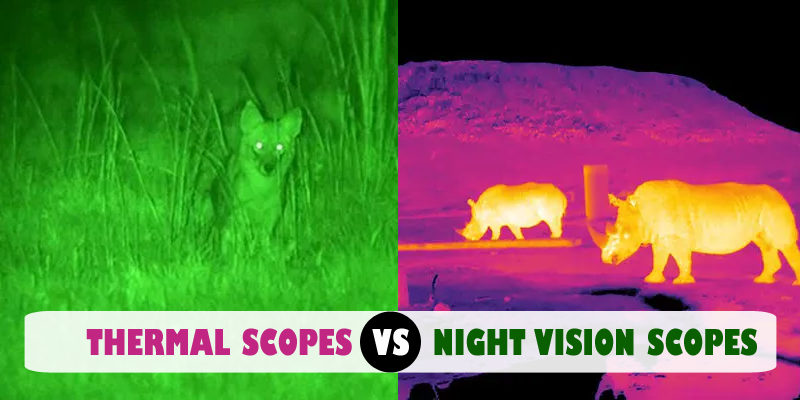 Here is a video of ATN ThOR 384 Thermal scope used by a hunter shows the thermal view of animals in various distances and how the reticle pattern helps to shot the coyote perfectly. It has user-friendly features but the operations are somewhat complicated for beginners. When we look out for the best thermal optics, you will only find a few brands to compare with. ATN ThOR HD 640 has gained the best place in this optics game by producing the best quality gears for years. ThOR 640 is one better version of Thor 384 with higher resolution thermal sensor. This ATN Thermal Scope has the latest technology. With the high-resolution sensor, it has so many useful night vision options. The Obsidian Core is an effectively dedicated computer on which this atn thermal scope has been running to solve the huge files with relatively easy. Using ATN Thor HD 640 is for easy than doing a setup on mobile phones. But the controls of ATN 640 can be processed via a smartphone that makes the purpose easier. It takes you apart from using such confusing charts and calculators with help of ATN obsidian shooting solution. This shooting option clears up all the complex calculations. The only thing you have to do is set the range and the environment data like wind readings once after you have made the set-up of the device. The remaining process including distance adjustments, incline angle changes, wind turning, and aim the prey for the perfect shot will be automatically performed with the obsidian core. This Thor 640 available with 4 different configurations. From the magnification range 1-10x the cheapest, to the 1.5-15x the current magnification every prefer, and the 2.5x-25x and 5-50x that are excel. 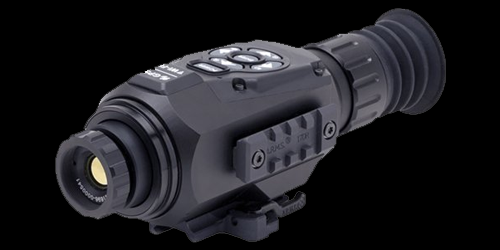 The ATN Thor 640 thermal scope with 1.5-15x configuration provides remarkable versatility. As there are various configurations available, you have multiple choices to choose between the wide field of view. You can get it wide maximum as a natural human eye, and you feel really closer to the target. The built-in rangefinder in the thermal scope makes the task of finding the distance of the target easy. It has the detection range of 874 yards and the smart zoom offers great quality, unlike other scopes which blur the focus and FOV when zooming. It helps to get the perfect vision to the target. With 640×480 thermal sensor, you will get the crystal clear images even in any darkness. This ATN Thor version is quite expensive and cannot be used in the daytime. Trijicon is new to the field of thermal optics but still, they have placed their name in the hunting and shooting industry. The devices produced from them are made of the best quality and durable for a long time. We can see this Trijicon serving in military and law enforcement in the future as they are known for using the military grade components on their products which increase the price but provide superior optics. 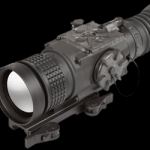 As of now, Trijicon has produced 4 thermal optics such as IR-Hunter, Rear-IR, IR-Patrol, and SNIPE-IR, all those on the same platform with solid design and no different features than other products. This thermal scope resolution is 640×480 and the zoom range is from 2.5x to 20x for the better targeting. You can use this thermal scope for long range hog hunting to short range deer hunting. Further, you don’t have any extreme color modes. As an added bonus, you can get the option for white or black hot. You are allowed to choose the outline mode to highlight the target without affecting the night vision. To provide a compact, lightweight, and powerful thermal scope is the concept of Trijicon Reap-IR. There are no difficulties to provide great performance in any kind of hunting from long to short range, as they are already proved themselves in urban streets and hard deserts. It has also had extras other than focus and zoom range. The integrated rangefinder built in this thermal scope read the distance and show you the target correctly. There is a single thumbstick to control and access the few other features of sight appearance and related functions easily. This provides absolute sight and is one best thermal scope for the money. Trijicon Teo Reap-IR Thermal Scope model does not hold a focusing ring, and you usually won't be able to get a clear thermal image of objects closer than 5 yards away. Even you have good thermal scopes that offer the best in less price, there are some scopes that are highly expensive. But the fact is, some of them are really worth the money. IR Defense IR Hunter Mark II 640 thermal scope is one of those. These optics are extremely serious about their concept and a tough competitor for the best thermal imaging scope in the market. It has the advanced features that are indeed to the professional hunters. The Enhanced Target Recognition system of this thermal scope makes the hunters feel happy. When you targeting the object that is away from the limit, you might be missing the sight. To address this issue, IR Defense IR Hunter Mark II thermal scope has ETP in every sensor gain settings about the target. The refresh rate of this scope is 60HZ which makes things smoother. If the battery is low, you have the option to change the refresh rate to 30 HZ and thus you can use the optic for a long time. There are three reticle options Thermal Combat Reticle, the Thermal Dot Reticle, and the Thermal Subtension Reticle; to focus on the target sharply. This IR-hunter has MILSPEC Emagin OLED display. The sensor resolution of 640×480 on even small screen can take crisp and clear images. If you would like to use the external display instead of built-in-screen, then you have a video output port to connect it and can use for preview. There is the uncooled vanadium oxide microbolometer inside the thermal imaging scope provides the view of the target in a wide variety. This scope can absolutely detect the hot and warm objects even in complete darkness. There is no need for additional illumination because of the lens and sensor. With the Digital Focus Control, you will have a couple of focus choices to get the perfect sight in different situations. This thermal scope is made of 6061-T6 aluminum to provide extreme resistance to corrosion and shock. It also has water resistance up to 3 inches for not more than 15 minutes. This IR-hunter thermal scope lacks in the remote control and the price is so high. Definitely, this is not for everybody but serves as the best thermal scope if that's what you need. If you are a frequent thermal device searcher, you must know about Flir, a thermal imaging brand which always ranks best. Armasight is their sub-brand for scopes. It uses the same FLIR’s thermal imaging technology. So coming to our list, this Armasight by FLIR Zeus 336 Thermal Scope mainly made as weapon scope, but now it can be used as a spotting optic or as thermal imaging device also. This Zenus 336 thermal scope is made as the perfect ergonomic design without compromising any essential features of a good thermal scope. This thermal scope uses the microbolometer core which is become one of the needed features used in Tactical Riflescopes and works well for patrol officers, security officials, force protection, and even special operation forces. The crystal image quality of this thermal riflescope make its applications wide and it also equipped with user-adjustable imaging tools; ACE, DDE, SSO, SSN, and AGC to make perfect shots at targets. It provides excellent optical performance when combined with the sensor. This scope goes through dust, smoke, fog, and other obstacles with the comfort to provide you a clear view of the target. It saves you and hides you from your target without allowing them to know about your spotting optics by not emitting the visible RF energy or any visible light. 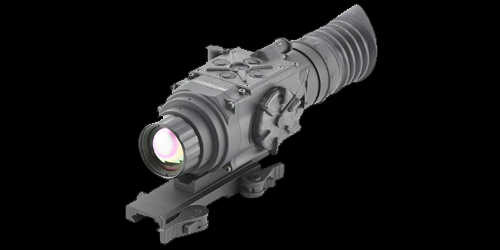 This lightweight thermal scope has an optical magnification of 3.4x to 2.8x. The thermal sensor resolution of 336×256 gives sharp images to their users. This thermal scope is easy to use and has the best build quality. It has made of aircraft-aluminum alloy and developed as CNC machined construction. So it can withstand any environment changes without causing any damage to the scope. MIL-STD-1913 mechanism is used in this scope. Therefore, it is easy to install and uninstall on Picatinny rail. It has external battery supply and uses electronic zoom reticle tracking with the digital zoom of 1X, 2X, and 4X and the color modes are White hot, Black hot, Rainbow, and a few. The battery life of this thermal scope is not appreciable. It often needs to be charged and it becomes an issue as it has an external power supply. There are only a few brands available for thermal scopes; everyone has their own popularity and unique features. Pulsar is one of the best thermal scope manufacturing companies that has started earning a name in the thermal industry in recent years. They have entered the market in 1994 as optics manufacturers later they started producing night vision devices also. The power of the scope and accurate data provided make this as the best thermal scope. To produce the improved image clarity, this pulsar thermal scope offers the resolution of 640×480 which provides the 3 times with the number of pixels on the screen. This image clarity is far better than the most recommended Pulsar version of Pulsar XQ with resolution 384×288. It has the picture-in-picture digital zoom up to 8x. Though zooming any target on scope blur the image, still you can get a clear zoomed image in XP than XQ because of its high resolution. And this is why we picked Pulsar XP into our list. Also, this Pulsar XP thermal scope has the magnification range between 2 and 13x. When you see about the detection range of thermal scope, you will understand why this Pulsar XP is better than its another model Pulsar XQ. Yes, this Pulsar Trail XP offers the detection range on the scope closely 2000 yards, this makes the product a huge hit. With this huge detection range, you can even spot your small targets in the range. This Pulsar Trail XP thermal scope has all the standard features like resisting water, fog, and shock. The scope is built in a way that it can work in any hard environments with dustproof construction. The Integrated high definition video recorder is built with this thermal scope to record the videos for future reference. The battery used in this are capable of running great for nearly 8 hours and if you add an optional battery pack then it will run up to 20 hours and more based the scope settings. It has features that enough hunting plenty. It suited for both long range and short range hunting. Below is the video of a hunter who has hunted the coyote using the Pulsar thermal scope. Pulsar XP device is not a set-and-go thermal scope; means the scope setting is difficult and make the hunters spend on its buttons and menu instead of letting them hunt. As we already discussed the link between Armasingt and Flir, and how they start together, now we can narrow down to our #7 product in the list Armasight by FLIR Zeus 640 Thermal Scope. As it has great overall performance, it never fails to impresses the hunters and reviewers. It can view through smoke, snow, fog, dust and built to work in any harsh environments. Like Zenus 336, this Zenus 640 thermal scope also doesn’t emit any visible light so no one can detect your scope and you can be safe in your field. This Zenus thermal scope has built with advanced thermal imaging camera so you can be sure about your target each time you take a shot. 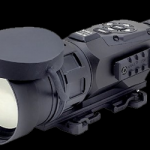 Zenus 640 scope can be used in both day and night and is extremely functional and practical. This allows hunters and LE professionals to use this scope with ease and convenience. It has the digital zoom range extends from 1x to 8x and has the following color palettes: White Hot, Black Hot, Fusion, Rainbow, Globow, Ironbow 1, Ironbow 2, Sepia, Color 1, Color 2, Ice-Fire, Rain, and OEM Custom. 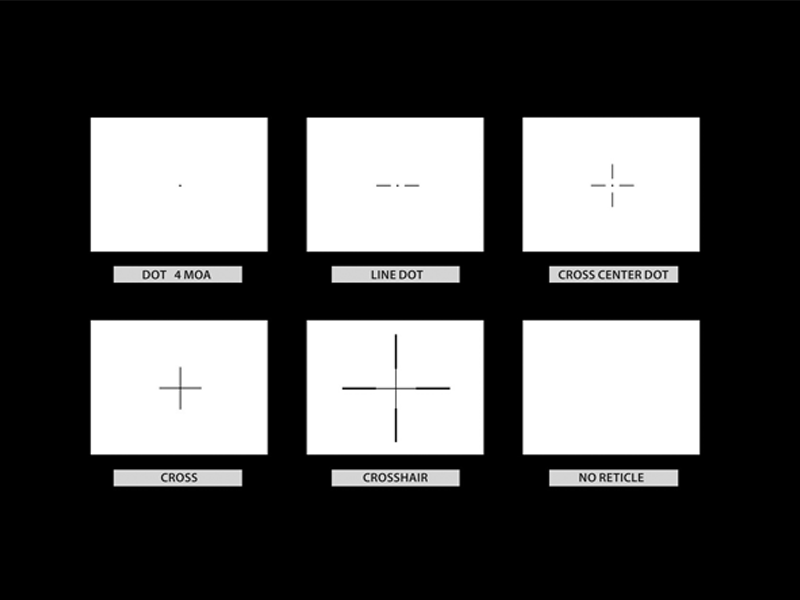 And it produces six reticle patterns such as no reticle, crosshair, cross, cross-center dot, line dot, and dot 4 MOA. You also have the remote control to operate the scope for tactical operations. This model has made as CNC machined aircraft-aluminum alloy construction and great in their compact size and portable weight. So your rifle won’t weight a lot. You can focus on your target without feeling it heavy. With the quick mount release feature, you can install and remove it on rifle easily. This thermal scope provides the Active Contrast Enhancement which creates different color levels to help you find the temperature difference in the sight. You can see the thermal sight of the area or target with 800×600 AMOLED SVGA display. The Zeus 640 powered by two CR123A batteries will run for 4 hours of use. It also features the video recording option; the recorded video files are saved to the onboard hard drive. You also have the replay option here; this will prevent you from going home with wrong or uncleared video. CR123A batteries can’t be charged by the gas station out. So you have to take up external batteries with you when you go out. The ATN X-Sight II Thermal Scope can be used as both day and night rifle scope. It has created with the best design among all the ATN models. The IR illuminator used in this thermal scope can illuminate the scene at night 3 times betters than using only stock infrared. This thermal scope is powered by the Obsidian core to make it process fast. It typically creates a billion cycles per second. It has a great magnification power of range between 5x-20x. With this quality, you can zoom the images with the smooth zoom feature and still get clearer images. As it has featured with the combination of superzoom and great magnification power, this model of ATN thermal scope become popular. You can adjust the focus levels without affecting the sight of the focus point, it also added with a ballistic calculator and smart range finder. The built-in laser range finder calculates the distance between your scope and your target. With this, you only need to adjust the scope and clicks images, the smart range finder automatically starts their process of calculating the distance. Earlier, hunters used completely different equipment to perform this. The rifle scopes with range finder avoid the need of carrying such external devices to find the target. It is important to know the distance of your prey from you to take a decision on shooting. With the ballistic calculator in the scope, you will away from the need for charts, reticles, and manual calculations. The distance measure from the range finder in the thermal scope is used by the ballistic calculator to make sure the perfect shot or hit. You have to enter the required environment details such as weather and atmospheric conditions, and then the accurate distance data will be given. A ballistic calculator can also give you a clear calculation in the trajectory of the bullet. After that, the point of impact is adjusted with the calculation to improve accuracy. The battery used in this thermal imaging scope can run continuously for 22 hours without requiring a recharge. It weighs high. With its 5 pounds of weight, ATN II surely defined as heavy. Huge size and bulky designs of thermal scopes always find the problem in mounting on old style rifles. But, this vintage style rifle scope Thor 4 from the well-known thermal device brand ATN can be mounted on any standard rings and it is suitable to any of the older rifle models. You rarely find the best thermal scope under 1000 and Thor 4 thermal scope is the one close to that. You will surely get better performance from this scope for the price it has. It has a moderate thermal sensor resolution that is 384 x 288. Though it does not offer long range, most of the nighttime targeting won’t exceed 200 yards so this may not be a worry I guess. The high tech sensor has been used in this scope to help you see everything your scope covers on your display with various image pallets. The ATN THOR 4 has processed by an Obsidian dual-core processor and has some latest features that are available in computer technology. It has the refresh rate of 60 Hz such that it is stated as the HD thermal imaging. With this upgraded refresh rate, even tiny targets can also visible in your scope regardless of any lighting conditions and distance. 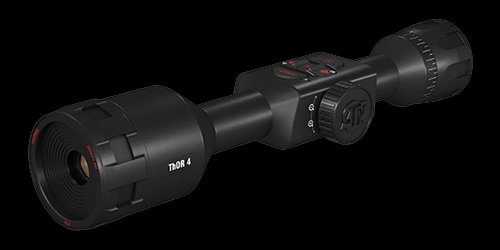 Like all other ATN thermal scopes, Thor 4 also records and exports video using an app and has rangefinder to calculate the distance. The video resolution is 1280×960. Another interesting feature of this ATN Thor 4 is Recoil Activated Video. This means the scope records the video of all your actions without asking you to press the button. So you can do hunting without any disturbance and see the riveting footages when you reach home and you keep these high-quality images for years. The battery life of this thermal scope is 18 hours if it used continuously. The ATN Obsidian App that has connected with the scope crashes often and Bluetooth function had issues in connection. If you are looking to buy a thermal scope under 2000, then this Armasight by FLIR Predator is the best choice for you. Though it doesn’t have any added features, with the basic scope features and thermal imaging technology, this thermal scope provides the best quality. The germanium lens used in this Predator is completely multi-coated with an infrared-transmitting coating. The thermal sensor in the scope receives the purest infrared light and generates sharp images. The two best digital features of this Predator 336 are Second Generation Digital Detail Enhancement and Active Contrast Enhancement. These features optimize the images automatically with sharp edges and high contrast. It can minimize the blur edges in the images. It has the digital zoom combination as 1x, 2x and 4x with the LED VGA display of 640×480. This thermal scope features 3 color pallets and 6 onboard digitally controlled reticle patterns added with the 5 different reticles to choose from. 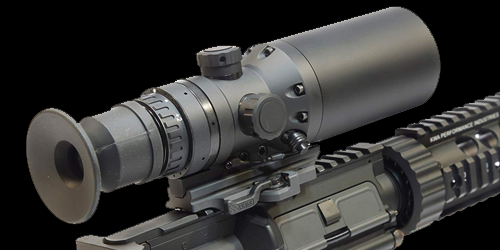 With the MIL-STD-1913 quick release mount, you install and remove this scope on rifle easily. It has FLIR’s latest thermal imaging technology and provides the best longevity to the product but with minimal military hardware. Predator uses common CR123 battery that offers extended battery life. It can be operated for up to 3 hours continuously on a single battery. Armasight offers a battery pack that can extend the operating time up to 7 hours if you need more battery life. For the better video streaming, the Predator has native video output that will store the recorded video on to the external storage device. You can control the scope remotely thus makes the video recording even easier so that it makes up the best surveillance device. It has less display resolution and battery life. The refresh rate is slow, only 30 Hz. Both the night vision and thermal imaging devices allow the user to see through darks. These devices can be used in hunting, tactical scenarios, and any inspections. Though both technologies help in night vision, the basic mechanism, the strengths, and weaknesses of these two devices have differed. It is important to know about technologies before you make the choice. Night vision devices magnify the visible light and available near-IR light and provide the night vision. Night vision devices have used from since World War 2 to now with several updates and new technologies. There will be a tube called image-intensifier tube inside every night vision device which receives the visible and IR light and intensifies it. The photocathode in NVD converts the photons that are the light comes via objective lens into electrons. When these electrons pass through the tube, the similar electrons released from the atom inside the tube will be enhanced with these electrons using a microchannel plate. The screen at the end of the tube is coated with phosphors. When that enhanced electrons hit this screen, the typical green night vision image is created from the photons that are released from phosphors. 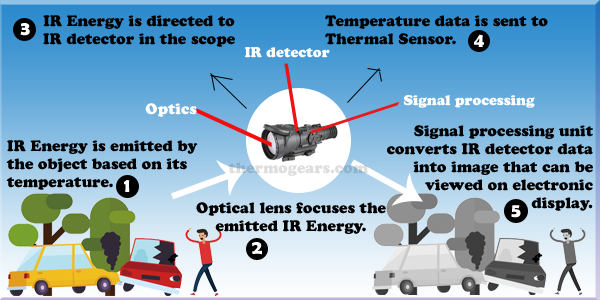 As we have already seen about Thermal imaging and how the thermal imaging scope works clearly, here I have simplified it. Thermal imaging device detects the thermal-IR light (heat radiation from the objects) and shows the temperature difference in different colors. So you will get the thermal or heat image of the targeted objects or area in colors. There are so many brands available for thermal devices and cameras. But for thermal scope, only a few brands get popular among the hunters. FLIR has been producing thermal optics since the 70s and one of the prominent brands for thermal cameras and devices. FLIR makes great high-end quality riflescopes even that are not their main market. FLIR involves in making video analytics, night vision, safety equipment, diagnostic tools, scopes, and cameras. Most of these are related to thermal technology. 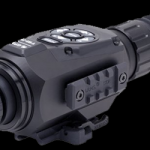 FLIR thermal optics are highly used in military and law enforcement applications also. ATN was founded in 1995 is the largest manufacturer of thermal scopes and devices. 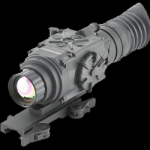 The ATN thermal scopes are produced with cutting-edge technology and high-performance capabilities. They have introduced the smart devices that can pair with their other ATN technology to ease the distance shooting. 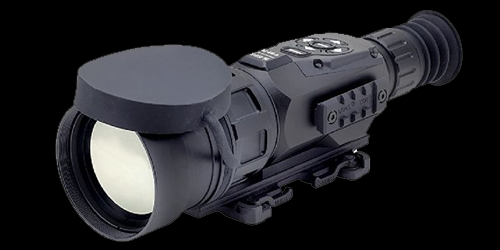 ATN also develope nigh vision optics, range finders, cameras and other nighttime gears for the hunters, military and security officials. 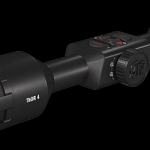 ATN THOR series of thermal scopes are favorite for hunters all around the world. Their scope was equipped with great core technology, different reticle patterns, and long battery life and more power to provide a high clarity vision. Trijicon Company has been available for 30 years. But they are new to the scope and thermal industry. But still, they have their name in every list of best shooting and night vision gears. Trijicon scopes have better vision and acquisition. Many LE officials hope about using Trijicon scopes in the future. As for now, they have only 4 thermal based models where all are from the same platform. Trijicon thermal scopes best for long range shooting and hunting. Pulsar Company has been present since the late 90s. This is founded by a small group of hunters to develop everything that improves their sport. Though Pulsar devices are not familiar with military and LE applications, they have been an ideal companion for most of the hunters. Pulsar scopes are known for its affordable price than other brands. When you search for the best thermal camera for hog hunting or best thermal scope for coyote hunting, pulsar scope would definitely come up. They have served best recently for deer hunting also. Below are some of the essential factors and features to look while purchasing the best thermal scope for hunting. Thermal scope magnification is the ability of the scope to magnify the distant object to extend it so that the viewer will see it in close. The extended range of thermal scopes is far better the traditional night vision scopes. Some best thermal scopes with high magnification have the range up to 1000 yards. Mostly the scopes’ magnification around 15x but we can also see scope with less than 5x. Based on your range of hunting, have to choose the scope. As like the digital cameras, the thermal cameras also use the image resolution to provide sharp and clear images. The quality of the image increase with an increase in resolution. If the resolution is high, you will get clear images even when zoomed. Anyhow, you are not going to get resolution near to megapixel and you don’t need it though. As a professional hunter, you should need a scope with a resolution 640×480. Don’t choose below 320×240, even if you are not a frequent hunter. 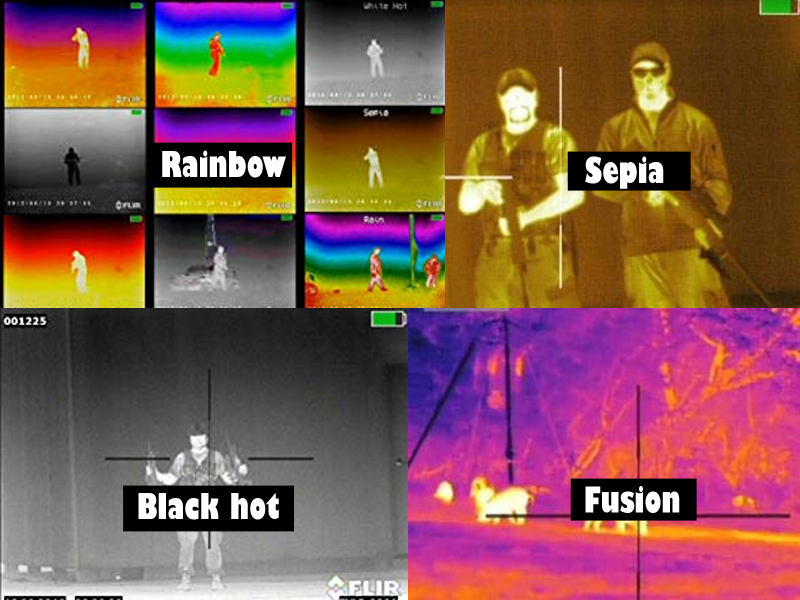 Thermal scope is available in color or monochrome options. A Monochrome thermal scope shows the thermal image in shades of grey. This scope displays the objects that emit high radiation as brighter than the surrounding based on the settings. The Color thermal scope displays the heat image with temperature difference in various colors and produces a colored heat map. Both are effective but if you are looking for absolute data choose the color scope which will see through smoke, fog, and dark. Whereas the monochrome thermal scope is cheaper than the color scope. A reticle is just a crosshair pointer that helps to target the object accurately. Thermal scopes come with different reticle patterns. 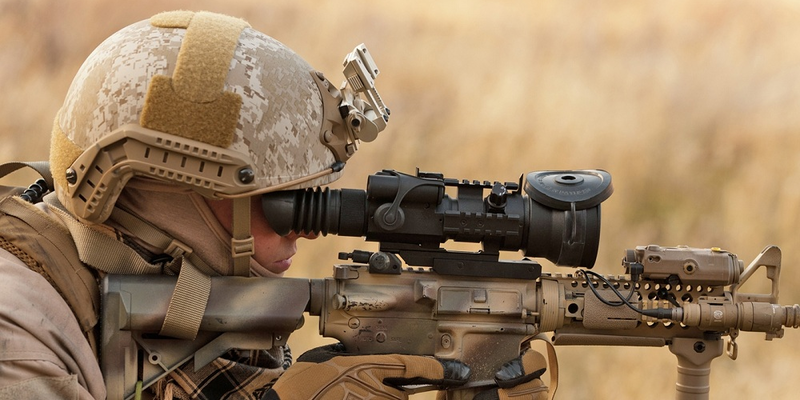 Thermal scopes are available with four-line standard reticle, or single-dot reticle. In four-line reticles, you have the options to choose from thicker lines to fine lines. Thermal scope with different reticle options allows you to choose between them as you need. And thermal scopes with no reticles also available. This is the rate of thermal scope at which it refreshes the screen. As more, it refreshes the screen, the more clear view you will get. Most thermal scopes come with a refresh rate of 30 Hertz or 60 Hertz, you can choose the right rate based on your needs. 30Hz is good for the static view and hunting and for the objects which move quickly or when you’re going to use the scope in movement, 60Hz is recommended. The difference in image quality between optical zoom and digital zoom. Thermal scopes available with either digital zoom or optical zoom and some have a combination of both. With zooming, it can magnify the distant object while viewing through the thermal scope. Digital zoom use the software to perform. It is best for nearest targets, for longest objects it shows image is less resolution. Optical zoom uses the lens and provides good quality images for longest targets also. It is important to consider the weight of the thermal scope because it will be mounted on the rifle and you have to carry it through hunting. The thermal scopes with high-end features and extras will weigh a lot. You can choose this scope when you don’t need to carry it for a long time. A scope with a fixed power source and have only basic thermal features, may weigh a lot less. It opts for those who spend a long time hunting and who needs to carry the rifle for all the way. Hunting in the dark is always interesting and but it will become a nightmare if you don’t have equipped with proper gears. After the arrival of night vision and thermal scopes, the rate of hunters increased. You should have knowledge about the recent technologies and devices to excel in your business or sport. Share your thoughts and views about using thermal scopes for hunting over night vision scopes. A thermal scope works on thermal infrared light, this means thermal scope does not depend on the light as it is going to work with the thermal radiation emitted from the objects. There are specific thermal scopes that work fine in both day and night. Thermal scopes vary based on the features it has. The basic thermal scope models that have only needed features are available from $1000 to $3000. 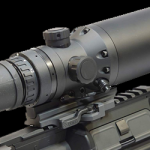 The advanced scopes with extended range, magnification and resolution cost above $5000. We have shortlisted the 10 best thermal scopes above where the first product ATN THOR HD 384 would my choice. The THOR series of all the models have great quality and features. The built-in rangefinder and ballistic calculator in the scope did the best. How to Zero a Thermal Scope? You can’t accurately see in a thermal sight on any standard target. So you will need some special targets that are particularly dedicated to working with the thermal sight. Still, detecting the bullet impacts is very hard here. If you can’t get the correct target from the thermal scope, find the way to place a halogen light on the ground followed by the target that is shining at the back side. I have seen this technique work well for many hunters. Some of the thermal scopes nowadays have the “clip on” function. With this, you don’t want to remount the daytime scope and re-zero it every day. Best clip on thermal scope designed to mount on any daytime rifle scopes. Pulsar FXQ38 is one best clip on the scope and you can also check for Armasight Apollo clip-on systems as they have great quality and advanced FLIR sensors.